Many apparent outgrowth/galls/blisters on blades found on a wild Palmaria palmata by Dr Jane Pottas at Filey Brigg, North Yorkshire, United Kingdom (54.217252, -0.265953) on September 2016. The Palmaria palmata was epiphytic on Laminaria hyperborea stipes. We recovered a small pieces of the dry blade of Palmaria palmata, rehydrated it for 24 hours in sterile seawater. 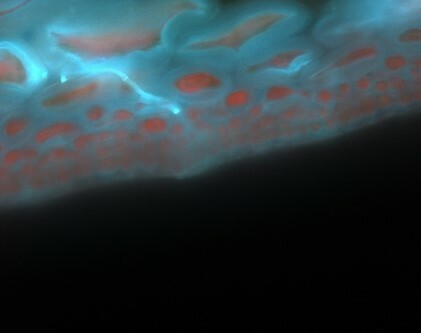 Then we made thin sections, incubated them in a fluorescent stain (calcofluor white) for rapid detection of yeasts, fungi and parasitic organisms under a microscope. Outgrowths/galls/blisters on the blade of Palmaria palmata. 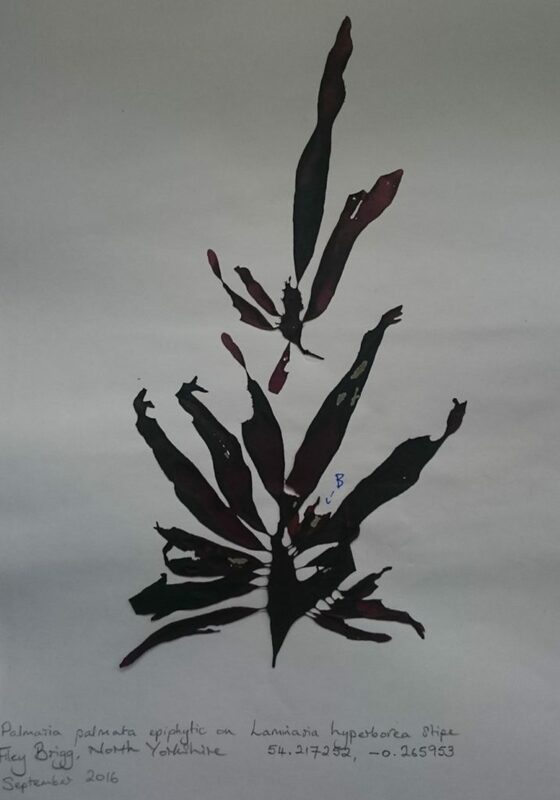 The full blade of this Palmaria palmata have been dried quickly and press in an herbarium, before being sent to us. 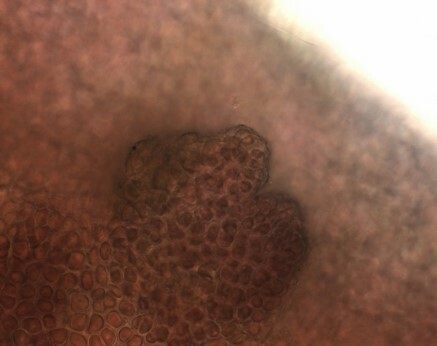 The direct and the microscopic observations of the rehydrated Palmaria palmata show that the outgrowths observed are genuine galls with cell proliferation of the small celled epidermis/cortex. 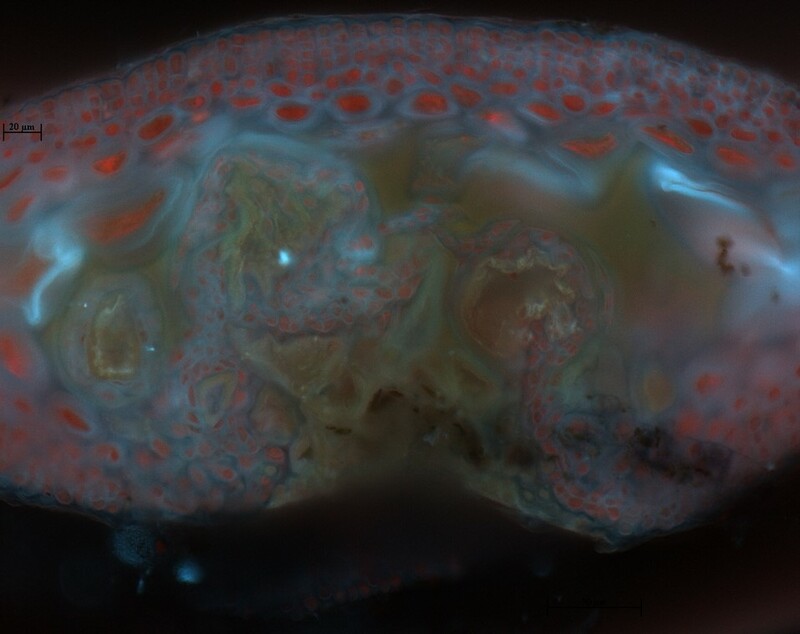 The heart of the gall features disorganised cell structures. Many galls are heart-shaped and cells look healthy at first sight. 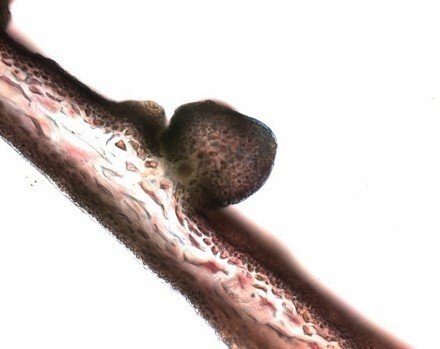 We are still investigating if the fungus is the cause of the gall formation, or if another microorganism might be responsible (e.g. virus, followed by an opportunistic colonisation of the galls by the fungus). Methods that we are employing range from molecular biology (e.g. PCR) and electron microscopy. 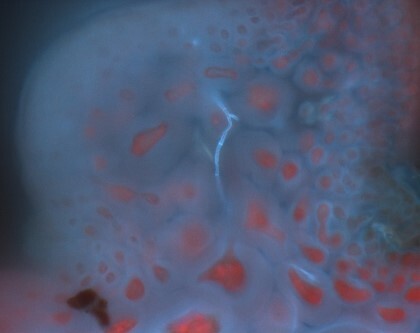 Apparent proliferation of epidermis cells how look healthy at first sight (i.e. 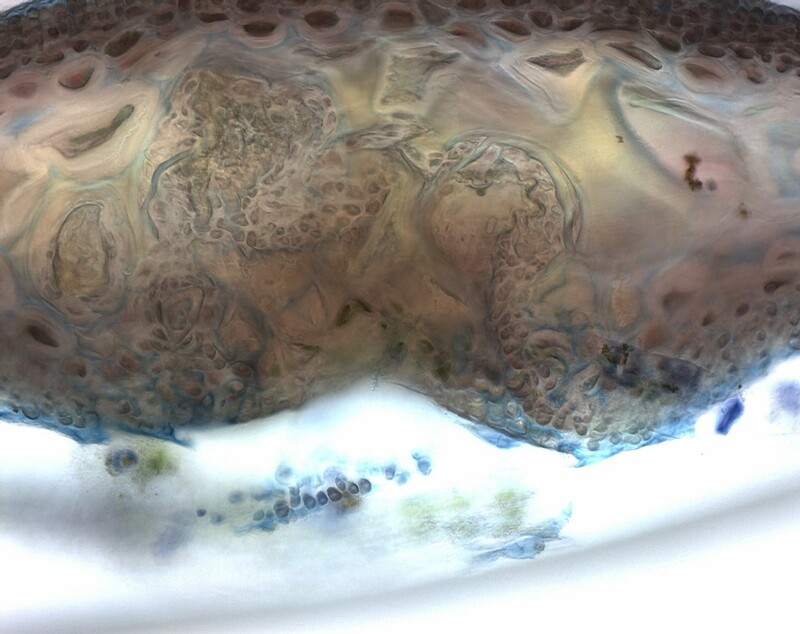 without staining). 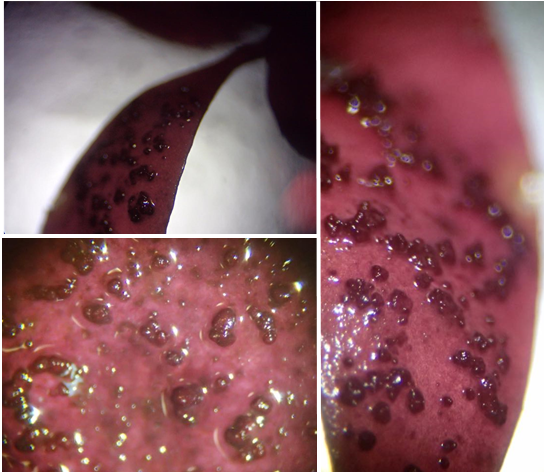 Hyphal colonization in the gall (2a) and in the blade tissue (2b). Late gall development in Palmaria palmata. The gall is breached and the fungal colonization seems absent.